The overarching theme of our center is Respiratory Epithelial Biology, exploring its functions, its response to infections, and testing treatments to improve its CF phenotype. 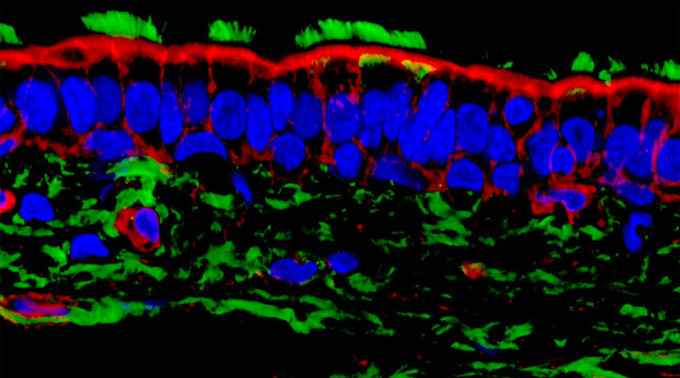 This includes (1) CFTR and ion transport, (2) the airway surface microenvironment and mucociliary clearance, (3) infections at the epithelial interface and (4) immune-epithelial cell defects that contribute to CF pathogenesis. The areas of research emphasis and the CF investigator groups that advance this vision are described below. These research relationships are enhanced by four cores: Human Airway Cells and Tissues, Assays, Infection and Immunity and Translational Studies. Biogenesis and degradation (Aridor, Brodsky, Bruchez, Frizzell, Thibodeau): This group examines the role of CFTR's structural features and chaperone networks in determining WT vs. mutant CFTR biogenesis vs. degradation. Protein biochemistry and CFTR cell biology are supported by functional assays, with a focus on the identification of critical quality control checkpoints and drug-mediated correction of off-pathway events. Apical CFTR/ENaC trafficking and activity (Bertrand, Butterworth, Carattino, Frizzell, Kleyman, Hughey, Swiatecka-Urban, Thibodeau, Watkins): This group focuses on the regulation of CFTR and ENaC activity and trafficking, apical QC, and protein interactions that determine apical channel density, endocytosis, recycling vs. degradation, and how these processes are altered by infection, proteases and protease inhibitors. Ion/water transport and the ASL (Bertrand, Bruchez, Frizzell, Myerburg, Pilewski, Watkins): This group is identifying the contributions of various transport proteins that mediate Na absorption and Cl/HCO3 secretion to ASL volume and composition and to the development of new genetically encoded reporters to quantify protein trafficking the regulation of airway surface liquid volume and composition in live cells. Optimizing airway drug delivery and isotopic clearance measurements (Corcoran, Garoff, Myerburg, Parker, Pilewski, Reed, Tilton, Przybycien): A clinical assay has been developed to evaluate therapeutic efficacy using concurrent isotopic measurements of mucociliary clearance and airway liquid absorption. New reagents and computational models are under development to assess ion, liquid, and solute transport across the airway epithelium and the impact of therapeutics delivery to obstructed airways. Inflammatory mediator mechanisms and anti-inflammatory therapies (Alcorn, Bomberger, Di, Gladwin, Hallows, Kolls, Montalero, Myerburg, Pilewski, Swiatecka-Urban): This group is interested in the role of IL17 family cytokines in the response to lung infection and host defense against Pseudomonas and Aspergillus and in therapeutic targeting of Th 17cells; it studies the impact of sequential viral and bacterial infections on airway cell biology, infection susceptibility, biofilm formation, and their therapeutic management. Host-pathogen interactions in the CF respiratory tract (Alcorn, Bomberger, Cooper, Methe, Morris, Di, Zemke, Lakdawala, Thibodeau, Butterworth, Corcoran, S. Lee, J. Lee): The studies underway with this group examine how respiratory infections are initated, maintained and treated in CF. Researchers have a variety of interests, including microbial evolution in the respiratory tract, development of antibiotic resistance, polymicrobial interactions in the respiratory tract, microbiome changed during pulmonary exacerbation, viral-bacterial co-infections and CF pathogenesis, respiratory viral infection mechanisms in CF and the development of novel antimicrobial therapies.